If you don’t own already a double strand pearl necklace in your jewelry collection, now is the time to consider it. It’s a must have classic that every woman should wear. Most of you already know the rules for wearing pearls and how to wear pearls without looking old-fashioned. This post will only cover today the versatility of a two strand pearl necklace. Keep reading because we will show you 5 double strand pearl necklaces perfect for any occasion. Plus, we will give you tips on how to wear them. 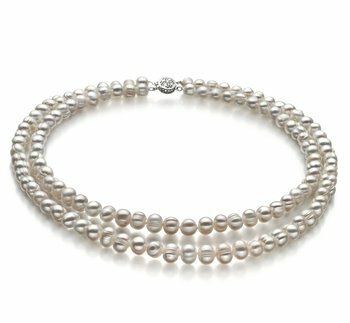 First of all, the double strand cultured pearl necklace is an extremely versatile jewelry piece and measures up to any formal attire. It can be worn during daily of night events. Secondly, it enhances your elegance and brings the touch of glamour that no other kind of jewelry is able to. You can build one image while wearing it with dresses and create a different outfit by adding a pair of jeans. A dressed up look accessorized with a double strand pearl necklace will always be in style, so let’s discover the five selected pieces. This glistening double strand white pearl necklace is perfect for daytime glamour. They will help up you achieve multiple looks, from vintage, retro to modern appearances. You can wear it at your sorority meeting, your daughter’s birthday party, or any special occasion. The white freshwater pearls may exhibit rings and ridges throughout the strand that makes them a limited treasure for you. But this makes it even more unique. Each pearl has its own distinctive identity and story. the picture above reveals the choker pearl necklace., so make sure to wear it on your skin directly. the same design can be found in our online store with black pearls or pink pearls. you can change the clasp. Next in our top is this stunning double stranded white pearl necklace. This is certainly a statement piece that manages to compliment any attire. Sophisticated and refined, this two strand pearl necklace is designed to give you that Grace Kelly look without too much effort. Gently worn on the neckline, the (AAA) shinning luster brings a natural and welcoming look to your casual and business wear. Wear it with a black dress with a classic cut or a red dress in order to impress. The 6-7 mm white pearls will give you a tantalizing appeal! Are you an admirer of Jackie Kennedy? Then try to achieve her look with a pink dress! Moreover, you can offer it as a gift to the special lady that always brings a smile on your face. It goes without saying that these pearls will last for generations, creating memories to carry on. you can order it with a different clasp. if you want to change the length, you can do it according to your preference (princess, matinee, opera, rope). this pearl necklace with two strands can be found in our online store with dyed black pearls or pink pearls. Now this is definitely not the classic pearl necklace, but surely a unique and updated design that had as a starting point the double strand pearl necklace. It is created with various shapes, luster and body of white and black pearls with alternating pieces of stunning silver beads separating the pearls. Perfect for a change and for the ladies who want to add a new and out of the ordinary air to their outfit, this distinctive pearl necklace will get you many compliments. You can totally achieve a trendy look with the playgul YinYang gems. If you don’t want to start wearing pearls by investing directly into a double strand pearl necklace, here is a very beautiful option. Start with one long strand of pearls like this one. At 30”, this white pearl necklace was designed to layer for best results. Consequently, you can wear a double stranded pearl necklace in various ways. One of the two layers can be closer to your neck, or, you can even them out in the double strand style and achieve the classic look. What’s more about this white pearl necklace is that each pearl is hand strung on a fine double knotted silk thread. As a result, they are separated with a hand tied double knot to ensure that no two pearls can rub, touch or damage the shape or luster of each other. Plus, the 6-7 size is a pleasant and welcoming size, perfect for any woman. layered as a double stranded pearl necklace gives you the freedom to add a small brooch to it, a flower pin, or a ribbon (you can frequently chance the color of the ribbon in order to match your outfit). 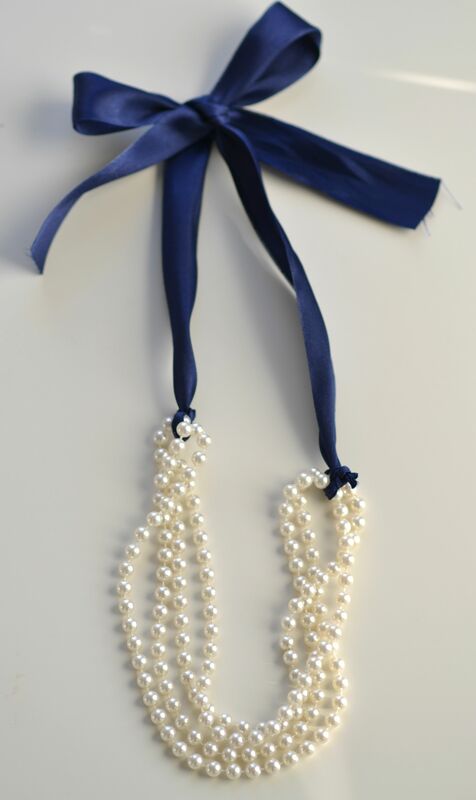 put the brooch/pin clasp in-between the knots of your pearls. Every woman will fall in love with the graceful lavender pearl double strand necklace. This is a promise! It is a delicate and refined pearl necklace, perfect for those in search for dainty colors to match their wardrobe. Obviously, this is a defining piece of classic cultured freshwater pearls, but with a subtle lavender note. It adds a note of sophistication to any attire. Wear it with a silk blouse, a taffeta dress or a nice black cashmere sweater to obtain that beautiful contrast. The perfect size, color and shimmer makes the Double Strand Lavender 6-6.5mm AA Quality Freshwater Pearl Necklace one choice you will never regret. a different clasp can replace the original. you have the chance to change the length according to your preference (princess, matinee, opera, rope). the 6-6.5 mm pearl size is ideal for petite women. To conclude, feel free to wear your favorite pearl necklace any time you feel like it. In order to achieve the best look, make sure it complements your skin tone and matches the colors of your outfit. Add the final touch to your special occasion look with a stunning double strand pearl necklace from our unique collection of freshwater pearl necklaces! A classic design guarantees it will never go out of style, while a trendy, out of the ordinary design will flatter your outfits!